Please note there are major story spoilers ahead for The Walking Dead: A New Frontier Episode Three. If you want to experience the episode as it was intended, we advise you turn back now. Also, note that this story summary is based on the major decisions we made during the episode. We’ve highlighted these whenever they appeared in the story. The Walking Dead: A New Frontier episode three kicks off with chapter one taking us back into the past once more. We rejoin the action with Javi and Kate searching for a propane tank in the neighborhood. Unfortunately, when they get to it, it’s empty. Kate, frustrated, throws it to the ground, before apologizing to Javi for making a noise and overreacting. As the two sit on the ground, silently in contemplation of what to do next, a young walker ambushes Javi through the door behind him. He tosses it to the ground and smashes its head repeatedly into the floor until it’s no longer moving. Despite asking for Kate’s hammer in the struggle with the Walker, she seemed to freeze up, recognizing the boy. It turns out that it was one of Gabe’s friends, Drew. After talking with Kate about how to deal with Walkers she recognizes, the player has an option to bond with Kate in a major decision. Here, you can either tell her you’re together and that’s all that matters, or just tell her you need to get back to the house. Regardless of which you pick, you’ll eventually make your way back to the house to a sleeping Gabe and Mariana. Kate and Javi discuss whether or not they should stay at the house or go. Kate talks him into going because it’s safer. No place is safe, so they’re better on the move. Gabe awakens and refuses to leave. He asks what happens if his dad returns and they’re all gone. The conversation leads to him saying he’ll stay and if he needs help he’ll just ask his friends. Unfortunately, this leads Kate and Javi into telling him that you just mashed his good friend Drew’s head into the pavement. With Gabe convinced, you decide that you’re going to set off first thing in the morning, but Gabe wants to leave his father a note. Exactly what it says is down to you, but Mariana will help him write the letter. Gabe pins it to the wall before the group set off on the road. The action then returns to the present day with the group meeting David for the first time. Gabe immediately runs to hug his father, while David inquires what happened to Kate. Javi tells David she needs a doctor right away, and David agrees, thanking Javi for getting her here in the process. Unfortunately, you’re not allowed to all walk freely into town with her. First, the group is sent to the quarantine area to be checked over by the doctor and to answer a few questions. Your trip here reunites the group with Eleanor who has been worried this whole time about Kate. She tells the group she had no reason not to trust these guys, but is eventually told by Tripp that this is the New Frontier and David is Javi’s brother. Oh, and he also lets slip that Kate is actually David’s wife, and is not officially romantically connected to Javi. Tripp then begins to come up with a theory that David planned to have Mariana and Kate short, or at least sent his men after them. Clementine doesn’t do us any favors here, either, confessing that she knows David and “he’s not a good guy.” You’ll then need to make a decision on what the group should do. We told them to just go along with the New Frontier’s demands and way of life for now, and just as we finished, David enters the quarantine zone. He tells Javi that Kate is asking for him, but none of the others are able to go with you. 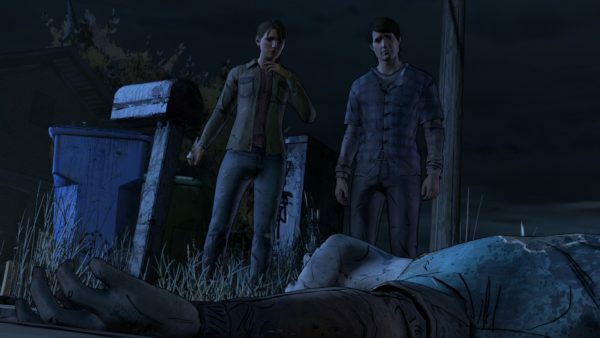 As you make your way out of the room, Clementine stares down David as the two brothers walk off.